From the Department of Neurology, Tongji Hospital, Tongji Medical College, Huazhong University of Science and Technology, Wuhan, China. A man in his 60s with no obvious trauma experienced sudden left-sided weakness and confusion. At a local hospital at 4.5 hours after onset, a cranial CT was unremarkable; the initial diagnosis was acute ischemic large artery stroke. He was transferred to our stroke center for mechanical thrombectomy within 6 hours. Digital subtraction angiography revealed no appearance of left common carotid artery and left subclavian artery, accompanied by suspicious protrusion of aortic false lumen (figure, A, arrows). 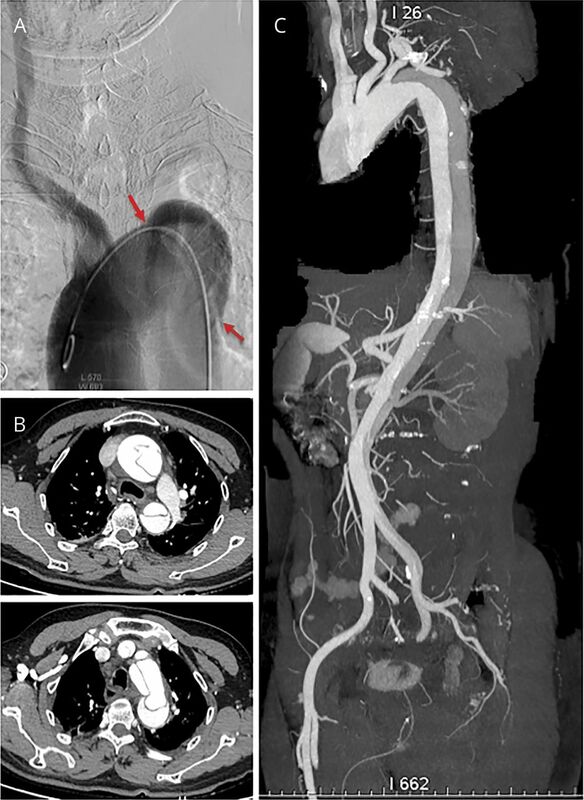 Aortic dissection was suspected and confirmed by CT angiography (figure, B and C), with emergent surgery following. Painless long-segmental aortic dissection should be considered during evaluation for IV thrombolysis and mechanical thrombectomy. (A) No visualization of left common carotid artery and subclavian artery shown in DSA, but protrusion of aortic false lumen (arrows). (B) Double lumen and aortic intramural hematoma shown in CTA. (C) Type 1 of DeBakey system that originates in ascending aorta, propagates to aortic arch, descending aorta, and involves thoracoabdominal aorta and left common iliac artery. Dr. Qin: study concept and design, acquisition of data, drafting the manuscript. Dr. Tian: critical revision of the manuscript for important intellectual content, study supervision, obtaining funding. This work was supported by National Natural Science Foundation of China (81171157, 81873743).